A menu for Seamore's included in Chernow's original application to Community Board 2's liquor licensing committee in 2015. CHELSEA — A co-owner of the The Meatball Shop is eyeing Chelsea for the second outpost of seafood restaurant. Michael Chernow, whose Little Italy venture Seamore’s opened in 2015, plans to open the eatery’s next location at 161 Eighth Ave., at West 18th Street, he told Community Board 4’s Business Licenses and Permits committee Tuesday evening. 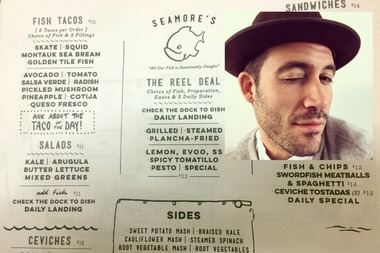 Chernow, who founded The Meatball Shop with childhood friend Daniel Holzman, has been a “passionate fisherman since childhood,” Seamore’s website says. The restaurant serves items including fish tacos ranging in price from $13 to $15, fish sandwiches with a salad or sweet potato fries for $17, and a $23 “Reel Deal” platter with the fish of the day, sauce and three sides, a menu shows. A brunch menu offers shrimp and grits, “fish cake bennies,” and a breakfast burrito with adobo squid, kale scramble and chorizo hash, among other items. All of the fish is "sustainably caught," and the eatery's vegetables are "sourced locally whenever possible," the menu notes. “The food’s good, I promise,” Chernow told the committee. The committee ultimately voted in support of Chernow’s application for a beer, wine and liquor license. Chernow said he hasn’t set an opening date for the restaurant yet.